Members of the UTHealth School of Public Health team: (From left to right) Solomon Wong; Palak Jalan; Don Gibson, M.H.A., president of Quantum Leadership (judge); Mallika Sharma and Katy Parrott. HOUSTON – Students showcased their teamwork, leadership, and management skills at the George McMillan Fleming Center’s sixth annual case competition Apr. 8. Teams from Texas A&M University, Texas Woman's University, The University of North Texas and UTHealth School of Public Health competed. Executives from MHMD, the Physician Network for the Memorial Hermann Health System; CHI St. Luke’s Health, Quantum Leadership, Memorial Hermann and Memorial Hermann Accountable Care Organization judged the competition. This year’s case centered on designing a population health strategy for a Medicaid managed care organization, to prevent and manage chronic disease. Each year, the Fleming Center selects cases reflecting current public health concerns. The School of Public Health team included three healthcare management M.P.H. students: Jalan, Mallika Sharma and Katy Parrott; and Solomon Wong, an M.P.H. student in epidemiology. The first place $1,000 prize went to The University of North Texas, and the second place $500 prize went to Texas Woman’s University. 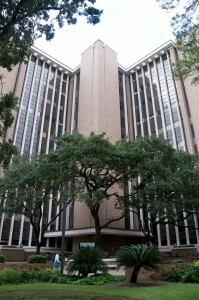 UTHealth School of Public Health placed third, and Texas A&M fourth. The student organization, The Board, organized the competition.